Richardson was born in Dewsbury, Yorkshire, England, the only son of Joshua Henry and Charlotte Maria Richardson. He was educated at Batley Grammar School and Trinity College, Cambridge, where he gained First Class Honours in Natural Sciences. He then got a DSc from University of London in 1904. Richardson was professor at Princeton University from 1906 to 1913, and returned to the UK in 1914 to become Wheatstone Professor of Physics at King's College London, where he was later made director of research. He retired in 1944, and died in 1959. He is buried in Brookwood Cemetery. He also researched the photoelectric effect, the gyromagnetic effect, the emission of electrons by chemical reactions, soft X-rays, and the spectrum of hydrogen. Richardson married Lilian Wilson, sister of his Cavendish colleague Harold Wilson, in 1906, and had two sons and a daughter. Richardson's own sister married the American physicist (and 1937 Nobel laureate) Clinton Davisson, who was Richardson's PhD student at Princeton. After Lilian's death in 1945, he was remarried in 1948 to Henriette Rupp, a physicist. Owen Willans Richardson had a son Harold Owen Richardson who specialised in Nuclear Physics and was also the chairman, Physics Department, Bedford College, London University and later on became emeritus professor at London University. 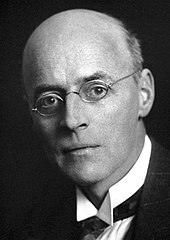 Richardson was elected a Fellow of the Royal Society (FRS) in 1913, and was awarded its Hughes Medal in 1920. He was awarded the Nobel Prize in Physics in 1928, "for his work on the thermionic phenomenon and especially for the discovery of the law named after him". He was knighted in 1939. ^ a b c Wilson, Wm (1960). "Owen Willans Richardson 1879–1959". Biographical Memoirs of Fellows of the Royal Society. Royal Society. 5. doi:10.1098/rsbm.1960.0016. ^ Rayleigh (1941). "Joseph John Thomson". Obituary Notices of Fellows of the Royal Society. 3 (10): 586–609. doi:10.1098/rsbm.1941.0024. ^ "Owen Willans Richardson: The Nobel Prize in Physics 1928". Les Prix Nobel. Nobel Foundation. 1928. Retrieved 17 September 2007. ^ a b "Richardson, Owen Willans (RCRT897OW)". A Cambridge Alumni Database. University of Cambridge. ^ "University intelligence". The Times (36893). London. 8 October 1902. p. 4. ^ O. W. Richardson (1901) "On the negative radiation from hot platinum," Philosophical of the Cambridge Philosophical Society, 11 : 286–295; see especially p. 287.